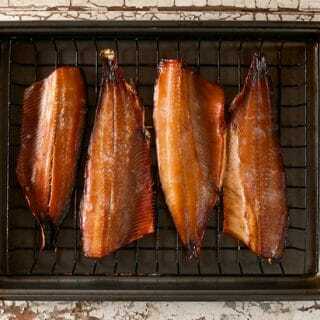 Smoked shad is, in the absence of a properly deboned shad fillet, the best way to eat this most bony of fishes. 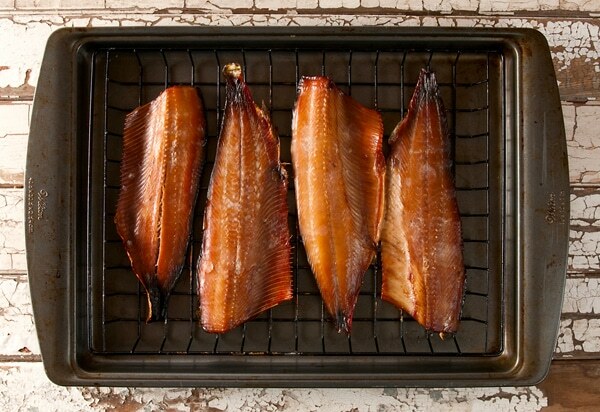 Shad is little more than a giant herring, and is nearly as oily as a mackerel or a bluefish — and oily fish make the best smoked fish. The method I describe below is for a hybrid between hot and cold-smoking. It results in luscious, smoky shad, with a hint of the flavorings. It will keep, wrapped in plastic, for two weeks in the fridge. Smoked shad also freezes well. How to eat this? Remember, there are still lots of bones in the “fillets.” My method is to flake out the meat into a bowl, then use the flaked, smoked shad for croquettes, in pasta or as a sort of dip when mixed with a garlicky aioli. You will need a way to smoke the fish. I use a Traeger smoker, but I’ve used offset smokers and even Webers before with good success. You want the temperature of the chamber to get no hotter than 180°F, but you want to hold it around 150°F for 2 to 3 hours. When in doubt, smoke longer and cooler. Alder is my preferred wood, but oak and maple are also good choices. This recipe works for any small, oily fish and I've used it a lot with mackerel, herring and small bluefish. The reason you have a double brine is that the first one clears out the slime and blood from the fish, and the second one seasons and flavors it. Don't alter the first brine, but you can alter the second as you see fit. Mix the first brine together and soak the shad fillets in it for 30 minutes, then drain. Meanwhile, bring the second brine to a simmer, stir well to combine and turn off the heat. Set this in a drafty or cool place to chill it down fast. When the second brine is cool, pour it over the shad and brine for 1-2 hours. Drain and rinse off the fillets, then pat dry with a towel. Air dry in a drafty place -- use a fan if need be -- for 2-3 hours, or until the meat looks a bit shiny. This is an important step; you are creating a sort of a second skin called a pellicle that is necessary to seal the fillets. 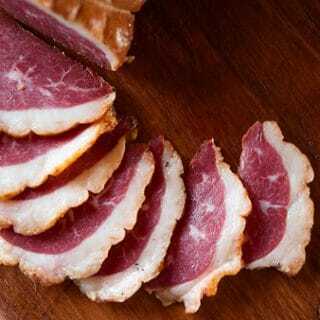 If you skip this step, you will have problems with the proteins leaking out from between the flakes of the meat, forming a white icky stuff that will need to be scraped off. Smoke over alder or hardwoods for 1-3 hours, depending on the heat. You want the shad to slowly collect smoke, and cook very slowly. Under no circumstances do you want the heat to get above 180°F. Remove and let cool at room temperature before packing away in the fridge or freezer. Wood choice is also up to you. For fish, I prefer fruit woods such as apple, or alder, maple or oak. Troy: 24 hours is a long time for shad fillets. I’d avoid it if at all possible. You can rinse the fish and pat them dry and leave them in the fridge for a day or two, though. I’m more into this smoked shad recipe than my smoked salmon lately. Delicious. And a welcome change of pace. Thank you. What a delicious recipe. Gotta get the hubs to make this for us this w/end!